This is an excerpt from my “Kona Rating Report“, a 120+ page with tons of information about the race, all Professional participants and their chances on October 14th. Get some more information about the report in this post or go straight to download your copy here (donations appreciated). The Course Rating for IM Hawaii is – 02:33. As you can see, the 2016 swim adjustment of -1:01 is considerably faster (or maybe “less slow”) than the overall swim rating of -3:43. Apparently, this was caused by moving the turnaround markers which have have shifted over the years. Therefore, it is likely that this year’s swim times will be a bit faster than in previous years and that most athletes will swim faster than the expected times (which are based on the slower swim rating). IM Hawaii is a P-8000 race. It has a total prize purse of 650.000 US$, paying ten deep. The strength of the field is 101% of a typical Kona field. 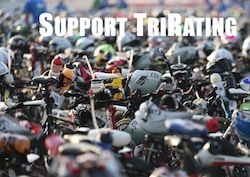 The strength of the field is 96% of a typical Kona field.